I always love to see what other moms are reading! If you’re the same, today I’m sharing what’s on my 2017 book list. I haven’t shared a book list in awhile, and I’ve received some reader questions about what I was planning to read this year. So here’s my list! Quite a few of these books I already owned, and I was feeling a desire to reread them. For some of them it’s been a few years since I last read them. Two of them are books I was sent to review. You might notice that I have quite a few Sally Clarkson books on my list (four, to be exact!). That’s because I just love Sally’s books! Sometimes I like to pick one author to focus on for the year, and Sally is my author for this year. I’ve already read all but one of them, so they’re mostly review, but they’re so full of encouragement that they’re worth a reread! I’ve also read 7 Habits and Discipline: The Glad Surrender before, but they also warranted reading again. 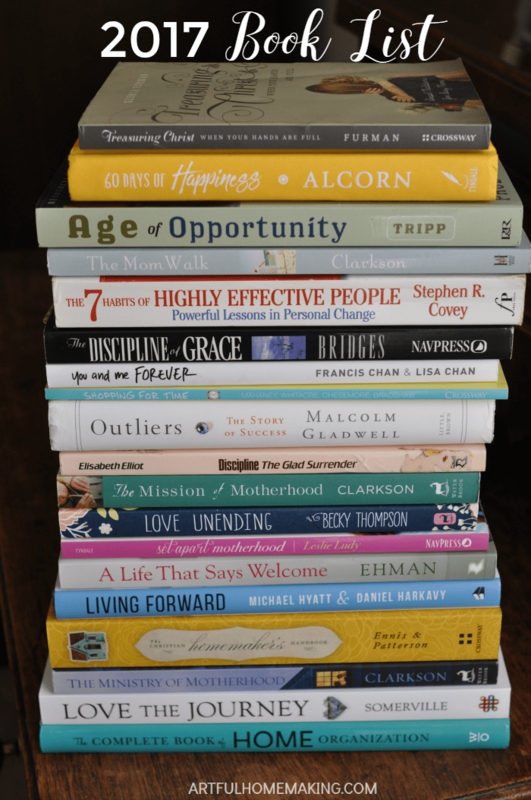 Since 2017 is my “Year to Cultivate,” I tried to pick books that would encourage and help me in all the areas I’m hoping to grow. 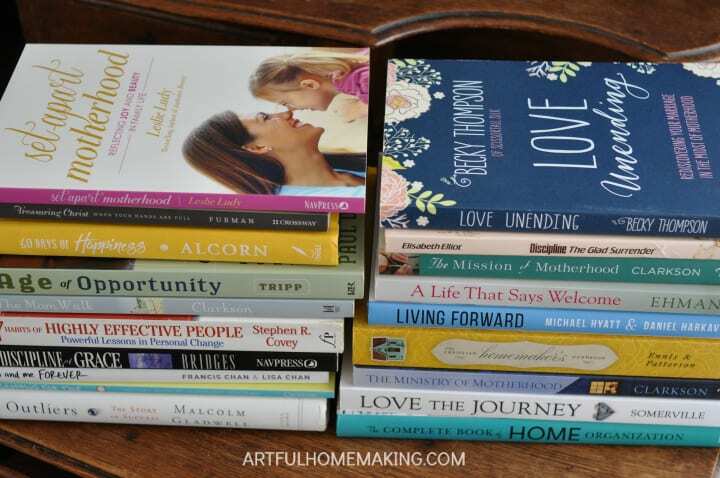 My list is heavy on the motherhood books, and that’s because I’m in the very busy and sometimes daunting season of younger children, pre-teens, and teenagers all at once! I need advice and encouragement! So, that’s my current list for this year. I often end up adding to it as the year progresses. What are you reading this year? I’m always looking for book suggestions! This post contains my affiliate links. Read my disclosure policy here. Sharing here. Thanks so much for stopping by, Leslie! I always have multiple books going at the same time too. How can you ever just pick one?! I love this list & am going to add some of your suggestions to my 2017 list. Thanks for sharing. Thanks for the encouragement, Alison! So glad you stopped by today! Wow! I’m always amazed by how many books there are in the world! I haven’t heard of many on your list, but I too and working through some that have been on my shelf for awhile. I’ve been really enjoying the Randy Alcorn devotional this year – I hope you do, too! So glad to hear you’re enjoying it, Lisa! I hope to start it soon! Haha! 🙂 I’ve had books like that. Sometimes I just can’t get into a certain book, and I eventually decide this just isn’t the right time to read it. Maybe this will be your year for that book! Thanks so much for stopping by, Sarah! What a great book list you have! (I tried to leave a comment on your blog, but for some reason Disqus doesn’t like me… 🙂 ) I’ve been wanting to read “Women of the Word,” and I’ve read “All Things for Good.” Thanks for sharing your list!